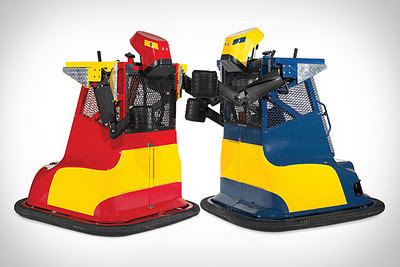 These handsome Robot Boxing Machines can be your for just $17,000 (£10,600) . Weighing 385.5 Kg they take fun-time, recreational robot rough and tumble to a whole new level. You and your chum pick your robot of choice, climb, and use a button and two joysticks to work the robot fisties. Just the thing for chasing the screaming neighbourhood kids around. WHAT?! They need to get used to being chased by robots. This entry was posted in WANT and tagged robots, toys. Bookmark the permalink.